As a student goes through a school day, there are many hiccups that prevent day from going smoothly. But what if there was a way to fix those stubborn, everyday struggles? Although some of these anxieties are unavoidable, some problems can be dealt with in under ten minutes. Freshman Kira Atkins expressed her struggle in which she doesn’t get to see her middle school friends as often. The transition from middle school to high school is a big shift, and often times students find themselves being dispersed into different classes, away from people who are familiar to them. It takes under ten minutes to join a club/sport together with friends. Some options include REACH club, Philosophy club, as well as winter and spring sports. Sometimes that isn’t an option, but it takes under a minute to strike up a conversation with a new classmate. Making new friends is always an option. Seniors Ally Schneider and Rachel Harper both shared their oppositions to the lack of communication between students and teachers. All teachers at Perry have at least one prep period when they are free to help students and answer any questions a student may have. If an educator’s schedule doesn’t meld with yours, try staying after school or coming in early. Sophomore Jordan Prioleau feels that the bathroom lines are too long “and the stalls are kind of gross.” The school bathrooms are something that every person has to utilize, so it only takes a short time for them to become messy. Before leaving the bathroom, take an extra few seconds to pick up the paper towels that are on the floor. If students make a collective effort to clean up their own messes, the facilities will be more presentable. Punctuality is a problem that every human has to deal with, but in school, it is especially important. In order to combat this problem, PMHS introduced hallway countdown clocks in 2015, but this year they were taken away. “I’m confused about the purpose of taking away the countdown clocks,” says senior Alice Smith. “I don’t know if I have time to go to the bathroom or not,” she adds. To resolve this dilemma, setting a six-minute countdown timer on a phone. It’s like having the countdown clock back, but at the tip of your fingers. In addition to the countdown clocks being abolished, lanyards are also a new factor in the school day. “I simply don’t like wearing it, and it’s hard to pick out outfits that match,” says sophomore Alyssa Seddon. 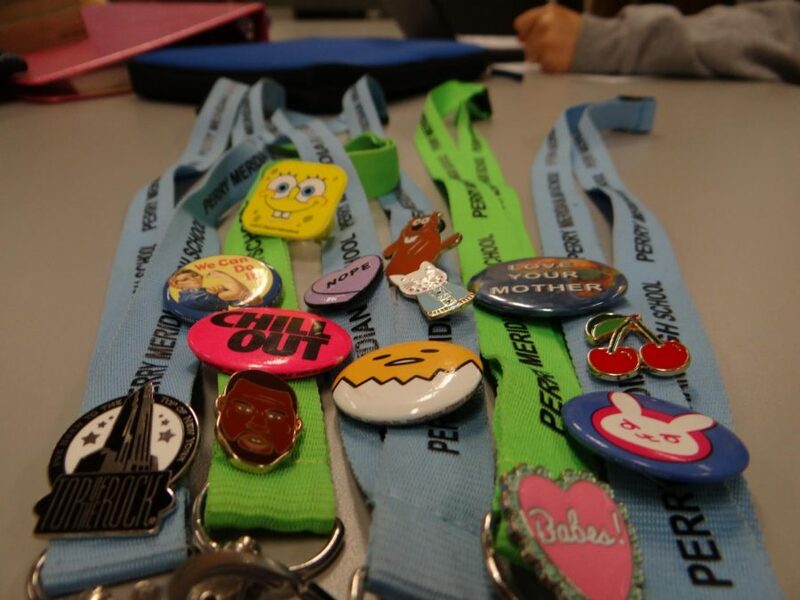 Many students, such as seniors Quinlynn Kunkel and Kyra Skeens, have been personalizing their lanyards with ribbon, buttons, stickers, and lapel pins. “It makes me actually want to wear it,” says Kunkel. Take an extra few minutes at home to look around the house for spare ribbons, or add a button with a band you like to your lanyard to give it some flare. “Instead of a school rule, it’s a fashion statement,” says Skeens.